What Happens When You Have Too Much Stuff? Have you ever been overwhelmed by how much stuff you have? When you’ve been living in one place for a while, you may not notice how much stuff you have. That's what happened to me, as I lived in Tulsa for 7 years. Then one day, you realize you have no more space to store anything. So where does all the stuff go? What happens when you have too much stuff? The startling realization that I had too much stuff occurred after I sold my three bedroom house in Tulsa, and moved to Boise, Idaho to help take care of my mom in the spring. I left a bunch of stuff in Tulsa in a 10’x15’ storage unit for the months I was in Boise. After my time in Boise, I moved to OKC. My friend, Kent, offered me a room in his house.I was downsizing from a three bedroom house with an attic and a basement, to living in one bedroom. When I opened my storage unit in Tulsa, I realized 97% of it would not be going with me to OKC. I had way too much stuff. After settling into OKC, I realized that the 3% in the storage unit, coupled with what had been in my car was still too much stuff. I would look through my overcrowded room, and wonder why I had so much stuff. Yet, I knew I couldn’t part ways with most of it. When I walked through the garage, I would see a few boxes full of things I knew I couldn’t get rid of. These things were important. What was in the boxes? I couldn’t tell you, but it was probably something an aunt or cousin gave me fifteen years ago. Maybe it was my baseball cards, or letters from church camp in high school. This was important stuff. You don’t just get rid of these necessary things. As I kept thinking about all of the stuff I own, I remembered something my friend Jay Mack said a few years ago. "If we’re not careful, the things we own will own us." I realized it had happened to me. I was being owned by my stuff. It was my stuff that made my room uncomfortable, and made my life feel overcrowded. What I learned was the stuff I thought I mightneed, I didn’t need. So I began a move towards minimalism. Over the past month, I’ve given away over 100 clothing items, 100 books, and thrown away a lot of unnecessary stuff. My life is becoming less cluttered as I do this. With each thing I give away, I feel a greater sense of energy and clarity. Here is a secret I’ve come to understand in the process. "When I minimize what isn’t important, I can maximize what is important." Getting a lot of these unimportant things out of my life has helped me clarify around what is important. I max out now on connecting with God and people, and creating meaningful work. Never in my wildest dreams would I have considered myself weighed down by all the stuff I had. The “muchness” of so many clothing options, seeing books I never intended to read again, and the clutter in my life had me spending too much time thinking about things that aren’t important to me. Am I a “true minimalist”? I think that is a somewhat fluid term, and you could get a lot of answers from different people. I don’t think the point of minimalism is to get rid of everything. At least for me, it isn’t. I believe minimalism is a tool to help clarify your life by getting rid of what is not important, so that you give yourself to what is of maximum importance to you. When we choose to minimize what is not important, I believe we will maximize what is important. 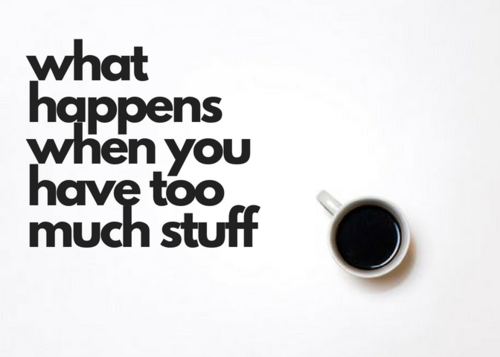 Is your life full of too much stuff? What would it be like to move out of clutter, and into clarity? Can you imagine how much more energy you would have to attend to what matters if you didn’t have to focus on the things piled up that aren’t important. What would it be like to minimize what is not important, so that you can maximize what is truly important to you?